HARRISBURG, Pa. (CNS) — Msgr. Vincent Topper, the oldest and longest-ordained diocesan priest in the country, died Oct. 7, the feast of Our Lady of the Rosary. He was 104. Remembered for his hard work and humility, Msgr. Topper died in his residence at St. Catherine Laboure Parish in Harrisburg, where he had been living since 1999. His funeral Mass was to be celebrated Oct. 15 at St. Catherine Laboure Church with burial at Annunciation Cemetery in McSherrystown. 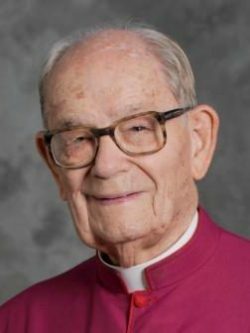 “His life was a shining example of fidelity and cooperation with God’s grace in a selfless and dedicated manner,” Harrisburg Bishop Ronald W. Gainer said of Msgr. Topper, who was a priest of the Diocese of Harrisburg for 80 years. Even on the Saturday and Sunday before his death, he continued to concelebrate Mass at the parish, and was surrounded with the praying of the rosary in his final days. “He teaches us a beautiful lesson of complete confidence in God,” said Father Neil Sullivan, pastor of St. Catherine’s. “In the last couple of months, as he was consecrating the host while celebrating Mass in the rectory chapel, he would just hold onto it and not want to let it go. He was deep in prayer,” Father Sullivan told The Catholic Witness, Harrisburg’s diocesan newspaper. Vincent James Huber Joseph Topper was born in Hanover July 28, 1912, to Vincent and Flora Topper. On the day he was born, he was baptized by a parish priest because doctors did not expect him to live because he had tuberculosis. His mother and three of his siblings died when he was very young, and his father nearly succumbed to the influenza epidemic of 1918. He was raised in St. Joseph Parish in Hanover, where he served as an altar boy for the 5:30 a.m. Mass, and attended St. Joseph School in Hanover and St. Mary’s High School in McSherrystown. Bishop Philip McDevitt accepted him into the diocese’s seminarian program, and he entered St. Vincent Seminary in Latrobe, where he spent two years in college in preparation for the seminary. Bishop George Leech ordained then-Father Topper to the priesthood at St. Patrick Cathedral in Harrisburg June 6, 1936. In each parish where he served as pastor, Msgr. Topper focused his efforts on expanding Catholic education. As pastor of St. Mary’s in Fairfield and administrator of its mission at St. Rita’s in Blue Ridge Summit, he purchased a bus and would drive students to and from school. At St. Joseph’s in Milton, he oversaw the construction of a school, and St. Joseph’s in York and St. Columba in Bloomsburg, he worked to expand classrooms. He was named a monsignor by Blessed Paul VI May 27, 1970. He retired from active ministry in 1977. In retirement, he visited a number of parishes in the diocese to review their financial records and offer advice on how to cut costs or increase funds, said Msgr. Hugh Overbaugh, a cousin. “He served the Lord so well, and was such a wonderful person,” Msgr. Overbaugh added. Early in his retirement, Msgr. Topper lived at a priests’ residence in Lebanon. When it was determined that the diocese would sell the property, Msgr. Overbaugh, then pastor of St. Catherine Laboure Parish, offered Msgr. Topper a room. The 80th anniversary of Msgr. Topper’s ordination to the priesthood was celebrated at St. Catherine’s on May 24 of this year, with clergy, religious, seminarians and laity in attendance. “The support and love of the people of God has sustained and continues to edify me. … Wonderful things happen when God is a part of our lives,” he said. In addition to his parents, he was preceded in death by two stepmothers and five siblings. He is survived by two sisters and as well as nieces, nephews, great-nieces and great-nephews. Reed is managing editor of The Catholic Witness, newspaper of the Diocese of Harrisburg.